While talking with my friend Terry last night, she mentioned that it was hard to leave a comment. Well, I think I fixed that, so give it a try and we'll find out! 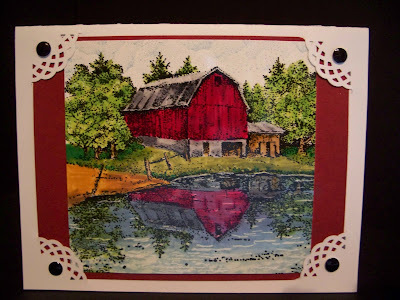 This card is a stamp from Rubber Cottage. I have had it awhile, but had not stamped it for some time. Stamped on glossy paper with dye ink and colored with Tombow markers. Tomorrow and Friday I go to Heidi's to get the kids on the bus. Haven't seen them since the weekend, so looking forward to seeing them in the morning. Your barn is beautiful! I haven't had any problems posting. But I've just been lurking lately! Too busy since I got home, trying to find homes for lots oif stamps! LOL! !